We are so grateful for the support of the KLM Legacy Bracelet from friends around the world! To date, 1,000 bracelets have been created and they have reached every corner of the globe. Karen lived a life dedicated to service, compassion for others, and generosity of spirit. Organizations and causes to which she shared her enthusiasm and passion include the New Trier High School Parents Association, Neighbors of Kenilworth Club, the North Suburban YMCA, and the Make it Better Online and Print Magazine. Karen served for nine years as a volunteer Grant Review Facilitator and Grant Reviewer for the Chicago Foundation for Education (CFE), where she helped facilitate more than six hundred thousand grants to Chicago-area schools and held a position on the Board of Directors. She served for six years as a Patient Care Volunteer and member of the Volunteer Advisory Board for JourneyCare Hospice. The organization nearest to Karen’s heart was the Junior League. 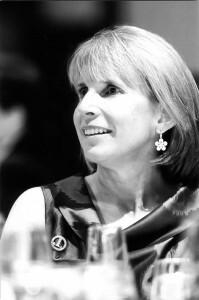 As an active member for 29 years, she held many leadership positions at both the Association of Junior Leagues International and the Junior League of Evanston-North Shore (JLE-NS) including including President, Membership Director, Community Director, Thrift House Chair, and Scholarships and Grants Chair. She founded and spearheaded many JLE-NS initiatives including Fitting Futures for working women, the Diaper Driver for new mothers as well as the League’s Scholarship Program, which provides scholarships for young women in need of resources to pursue their education and/or careers. In 2008, Karen was awarded the The President’s Lifetime Achievement Award for contributing over 4,000 hours of volunteer service. Earlier this year, she received the 2016-17 JLE-NS Outstanding Community Volunteer Award. During her tenure as the Scholarships and Grants Chair at JLE-NS, Karen received a call from Uweza Foundation Executive Director Jennifer Sapitro, then a graduating college student, seeking funding assistance for a volunteer trip to Nairobi, Kenya. Karen did not hesitate to provide Jennifer with an opportunity to apply and her committee later awarded Jennifer with a scholarship to provide funding for the trip. Two years and three return trips to Kenya later, Jennifer founded Uweza with the hopes of providing young Kenyans with resources and opportunities to utilize their skills and talents to improve their lives. Jennifer and Karen continued their friendship over the years and in 2015, decided to work together create a program to empower young women living in Kibera, an informal settlement in Nairobi. Karen suggested the name Bright Futures and, with support from JLE-NS, the program officially launched in March 2015. Bright Futures supports young women entrepreneurs in Kibera through business training, income-generating activities, business loans, mentorship, and life skills training. Karen was the driving force behind ensuring that the program took off and succeeded. She led a design competition to create the Bright Futures logo, presented on the partnership at an ALJI conference and worked tirelessly on the publication of stories about the program and partnership in Sheridan Road magazine and Junior League’s Connected publication. Now almost three years old, the Bright Futures program continues to empower young women in Kibera. More than 30 women have received business training through the program and are currently applying for loans to start new small businesses or sustain currently-existing businesses. Group members make and sell liquid soap and meet every weekend to exchange ideas and participate in group savings and loans to support themselves. Uweza Foundation and JLE-NS will continue to honor Karen’s passion and dedication to empowering women in Kenya and around the world in the months and years to come. In 2017, JLE-NS provided additional grant funding for the program and have provided Uweza with an opportunity to sell jewelry and products made by women in Kenya at their annual Marketplace event in order to raise additional funding for the program. In the near future, members of JLE-NS will be supporting the entrepreneurs in Kenya through mentorship, both onsite in Kenya and through online communications. The KLM Legacy Bracelet was imagined and designed by Karen, members of her family, and members of Uweza staff in celebration of Karen’s life and in support of the Bright Futures program to which she dedicated so much of her time and enthusiasm. Every bead on the bracelet represents a relationship, event, or experience in Karen’s life and the multitude of colors symbolize the vibrancy of her spirit. All of the proceeds from the sales of KLM Legacy Bracelets will go to Bright Futures. Each bracelet is handmade by a woman living in Kibera and is packaged in a cloth pouch, also designed and sewn by a woman living in Kibera. The KLM Legacy Bracelet combines Karen’s passion for creating economic opportunities for women with her passion for supporting Kenyan women artisans and designers. KLM Legacy Bracelets can be purchased through the Junior League of Evanston North-Shore by contacting Stephanie Proesel at stephanieroberts@mac.com. The bracelet is also available online via http://uwezashop.com/products/klm.